As we sail through the clear, warm waters of Sithonia, on the Greek peninsula of Halkidiki, I move towards the front of the boat and lie down on some cushions to bask in the sun. Sandy beaches stretch all around me, licked by water so clear I can see right down to the seabed. 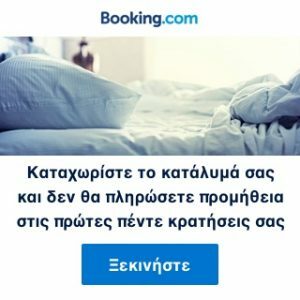 Best of all - there's no one around to disrupt my peace, because northern Greece's Halkidiki coastline is still a secret shared surprisingly only by a few. 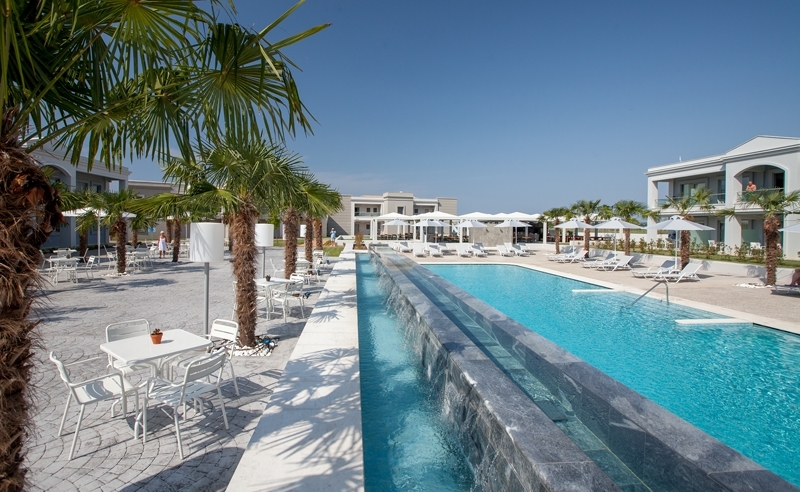 A 45-minute drive from the city of Thessaloniki, Kalives is home to the new five-star, all-inclusive, adults-only TUI SENSIMAR Blue Lagoon Palace, where I settle for the weekend. The hotel, which has a chic, contemporary feel with its open-plan design, enjoys direct access to a sandy beach and calm, blue waters - although my bright white room has its own private, generously-sized swimming pool, so I don't really need to move too far for a dip. When I finally feel in the mood for socialising, I shift to the resort's sea-facing swimming pool, where padded sun-loungers are set on platforms in the water, providing the coolest comfort possible in the Aegean heat. For even more relaxation, I visit the hotel spa for an hour-long Balinese massage, where I'm encouraged to listen to soothing music and switch off from the world, while tension is released from my knotted back. A choice of only two restaurants - one a la carte and another buffet - may sound insufficient, but both serve an excellent variety of dishes; the grilled lamb and peppers are particularly good, not to mention the pistachio-chocolate fountain. The resort can organise excursions for guests to explore the surrounding area too, including a trip to Lake Kerkini. Although it's a three-hour drive to reach the nature spot, which sits 20km from the Bulgarian border, the wealth of wildlife on offer makes it well worth it. We take a wooden boat to reach the middle of the lake, the best place for birdwatching. I'm struck by the reflection of the blue sky and clouds captured in the still water, interrupted only by the arrival of multiple pelicans, ducks and herons. After lunch in a local restaurant - and the rare opportunity to try braised buffalo, which incidentally tastes identical to beef - a ride in a 4x4 concludes the day. At one point, we are surrounded by a herd of water buffalo grazing in marshes and dense green grass. Although their horns look fierce, their nature is very placid, and flapping their ears to get rid of flies is about as much movement as they muster. But it's a mesmerising, relaxing sight. On the Sailaway Sithonia excursion, I visit small islands around Vourvourou Bay, where the clear warm waters were graced by Brad Pitt and Angelina Jolie back in 2012. After a 30-minute drive from Kalives, we board a boat and spend the afternoon snorkelling, diving from the deck and worshipping the sun. It's the kind of experience I previously thought was only possible on one of Greece's famous islands, but I now realise there's just as much seaside beauty on the mainland - only minus the crowds. 1. 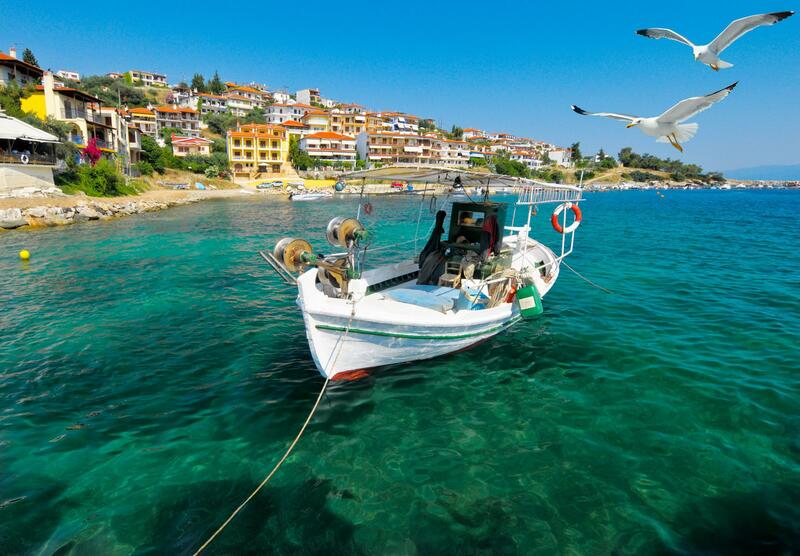 Halkidiki boasts 550km of picturesque coastline, the longest in Greece. 2. The stretch is made up of three peninsulas, Kassandra, Sithonia and Athos, that resemble 'three fingers' pointing out at the North Aegean Sea. 3. According to Greek mythology, Halkidiki was the place where Gigantomachy, the battle between the giants and the Olympians, took place. 4. Halkidiki was the birthplace of Aristotle, the ancient Greek philosopher and scientist. 5. Mount Athos is the oldest surviving monastic community in the world. 6. Women are not allowed within 500 metres of the shore of Mount Athos, and even female animals are prohibited. This is because the Virgin Mary is said to have visited the peninsula and prayed to have it as her own. 7. Over 6,500 beekeepers (32% of the country's total) and 1.910 tons of honey is produced annually. TUI (tui.co.uk; 0871 230 2800) offers seven night holidays at the 5T Blue Lagoon Palace from £1223 pp (based on two adults sharing), on an all-inclusive basis. Price includes transfers and flights departing London Gatwick in August 2018.